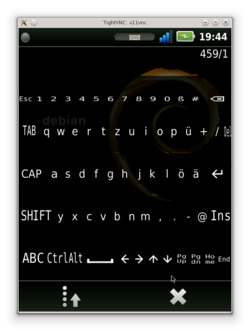 QtMoko is a Debian based distribution for the Neo FreeRunner. 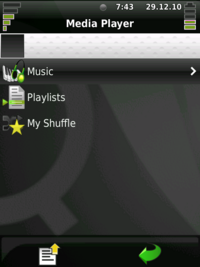 The phone and user interface are based on Qt Extended Improved formerly known as Qtopia. The QtMoko wiki can be found here. Further information on QtMoko and the current state of development can be found on its website. OpenMobile Installer is a zip-file that contains images. download qtm-installer-v26.zip and unpack the file on the FAT-partition of your microSD card. Select boot from microSD and after 3 automatic reboots and flashing the QtMoko is installed including Navit. If you flash the FreeRunner with a kernel image from QtMoko, then you must install the kernel and the root file system with dfu-util. NOTE: You need a fully charged Freerunner for installation. Installing QtMoko on your microSD Card depends on the Bootloader you are using, U-Boot or Qi. If you have Qi installed then you can install QtMoko on the SD card. This seems to be useful if you want to work with different distribution and you can change the distribution just by changing the microSD card in your FreeRunner. NOTE: Installation in NAND-Memory with Qi is possible without errors, but with an installed bootloader Qi the boot process will terminate (with Qi installed by Android, which is modified). Install a non-Android Qi version or u-Boot instead! If you use Qi, you only need an ext2 partition into your µSD Card where you uncompress the root filesystem image file qtmoko-debian-v26.tar.gz. In this case Qi Bootloader is going to look for the kernel image into the /boot directory for file named uImage-GTA02.bin . This procedure was tested only on Neo1973. The biggest disadvantage is the fact, that you will still be able to have only one distribution on the device at once. You can change the sd card, of course, or install another system to NAND flash, but you can have only one kernel flashed on device. The only advantage is more space for system. This procedure is derived from Booting_from_SD. Hold aux and power button. Flash the kernel (you must be root). Connect to u-Boot console (you must be root). menu_x defines xth row of bootmenu, select the one you want to define. Edit selected boot entry (for example 5th row). Note that it's impossible to copy & paste, so you will probably have to write it all by your own. Check your edited entry (backslashes are not displayed anymore). If it works, you can set it as default boot procedure according to this procedure http://wiki.openmoko.org/wiki/Booting_from_SD#Autoboot_from_SDHC. If you have Qi or Android (with a modified Qi) installed on your Freerunner then install U-Boot again as a bootloader by downloading a U-Boot-binary on http://downloads.openmoko.org/distro/unstable/daily/ otherwise the boot process will terminate and you have to install u-Boot. Enable internet connection via USB Networking so that the installation of packages will be possible. After finishing the installation without errors you have to start the FreeRunner and calibrate the touch screen. Then you see the installed QtMoko on your device. If the first ping works and the second doesn't then check the DNS server settings (see USB Networking). ssh root@openmoko "date -us @`date -u +%s`"
For further detail see Setting Date and Time. If you want to install e.g. Twinkle and Navit on QtMoko the size of internal NAND memory is not sufficient (Twinkle need > 100MB). By creating symbolic links some memory problems can be avoided. NOTE: (Size Root Filesystem) Create symbolic links from root file system to SD-card to save internal memory.If some folders are symb-linked to SD-Card (with e.g. ext2 partition), e.g. It recommended to use an ext2-partition. After creating symb-links install software. Consider installing QtMoko on MircroSD instead with Qi, if you want to make use of debian applications that exceed NAND memory capacity. Replace myapplication by the package name of application name you want to start, e.g. if you want to install the command line editor vim. First add the squeeze-backports to your /etc/apt/sources.list . and you should be seeing some numbers. last but not least edit the navit.xml to enable the flite speech part which is commented out and paste an OSD layout section from the navit homepage which you like in the osd section in navit.xml, then enable the mapset for some XYZ.bin mapfile which you get with the navit planet extrator and adjust the link to properly point to that file. make sure this mapset is the only one which is enabled! If you want to install e.g. the application Navit, you have to install the following packages. Navit needs and X-Server and it will run under QX. The zip-package is necessary to unzip the navit-qtm.zip package. During unzip you will be asked to replace /opt/qtmoko/bin/ppp-network. This has to be done to solve problems with DNS over GPRS. Backup ppp-network file before unzipping navit-qtm.zip. 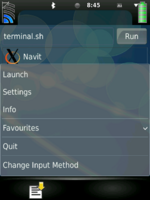 After restart you can start Navit under QX. NOTE: Both MAPSET and MAP have to be enabled to work with the OSM-map in Navit. Open Main Menu by clicking on the green Q-Topia "Q"-Box. Open Applications (4 Boxes, red, yellow, green, blue). Scroll down and open QX. Click on the white Paper Icon on the bottom left to open the context menu of the QX application. Select Launch to start Navit. Exit with AUX-Button without stopping navit. QtMoko has an integrated VoIP-Client, which would be perfect to use a SIP-Account to do free of charge mobile communication world wide. But at the moment the integrated VoIP-Client does not work, due to some strange problems in Version v24 (see QtMoko homepage for current status of development). For installation of Twinkle your need 105MB. It would be necessary to install QtMoko on microSD. You can use Linphone (http://www.linphone.org) instead, which will use 83MB. See additional information on the OpenMoko-Linphone pages. As visible on QtMoko-Wiki Syncing Calendar data is not working at the moment. Some work has be done (Thanks to mossroy), so that iCal-Files (ics) can be imported to your QtMoko calendar via a perlscript ics2qtcal.pl. Choose the current version from http://mossroy.free.fr/ics2qtcal/. importing the an ics-file into the Qt-Calendar. The ics-File can be an exported calendar in an iCal File (e.g. mycalendar.ics) which is transfered to your Neo. import mycalendar.ics with scripts into your SQLite Database. remotesync4ics2openmoko.sh -u "$vUser" -p "$vPWD" "$vICS1" "$vICS2"
Please edit the file syncal and modify the username and password for accessing ics-file on a remote groupware server, where your iCal-file is stored. because without the desktop-definition file an application will not be visible in QX-favourites. with your confidential username, password and file URL for the remote ics files. You can import more than one remote ICS-files, so 2 variables for file URLs are defined. Change that to your appropriate number of remote ICS-files. See remotesync4ics2openmoko.sh for further details. If you do not want to store the password in the script for security reasons you can use xdialog for entering the vPWD via user interface (e.g. input box). If you want to setup your own groupware server for testing on your own Linux Box, you can try CitaDel. Accessing the remote ics-file are explained on the homepage of http://www.citadel.org. Evolution stores the calendar data in the iCal-file calendar.ics. So you might to use the files directly. The scripts of Mossroy must be modified for this, because the scripts use wget to download the ics-files. You might prefer some applications and you use them more frequent. Then you might want them to add to your favorites. Go the application list and select (highlight, but do not start) application. click on the paper icon on bottom left and select Add to Favorite. Then you will have this Icon in the favorites menu (yellow star in main menu) too. A bit more difficult (i.e. 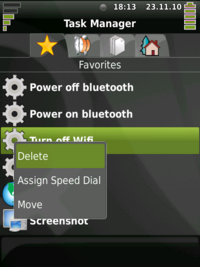 more hidden in QtMoko) is to delete icons from the favorites menu. start Task Manager in main menu by pressing the AUX-Button on you freerunner. Select the application your want to remove from favorites (keep pressed for a few seconds on the application until the context menu appear. The icon you want to delete should not be selected before. select delete from context menu and the icon disappears from favorites. For adding Favourites in the X-Server environment see QX. where 1.19, 1.19 and 1.44 are the gamma values for red, green and blue. GTA02 can't play native 480x640 video - processor is good enough for decoding it, but the graphics card bus is too slow to get the information through to have a decent framerate. 240x320 is only a fourth of that information and this does work even when being scaled to 480x640 to run fullscreen. When encouter a GdK-Warning using Xdialog in scripts you can remove the warning with sed. This warning is part of the return string of an inputbox in xdialog. NOTE: This application sed is a workaround. The best solution is a modifacition that removes the GdK-warning itself. To test this script on your freerunner, you have to start it from the terminal in QX. Source of the xdialog script is used from http://xdialog.free.fr. [Apt-Get] (jffs2) Couldn't make mmap ...: (solved with the following workaround) If that happens regularly, create two scripts apt-start and apt-stop. These scripts are used before and after apt-get use. echo "apt-get can now be used"
press ESC and then ":w"
start vi for the script apt-stop. echo "Now old settings for apt-get are restored"
Replace mysoftware with the package you want to install e.g. linphone. In case your ext3 partition gets corrupted take out the sdcard from your freerunner, put it in a card reader and insert the card reader in one of the usb slots of your desktop linux system. In contacts menu there is "Send All..." You can then send contacts using bluetooth or email. If you use email and you don't have smtp setup up, you can download the mail message from /home/root/Applications/qtopiamail and open in e.g. in kmail and save the VCF attachment. For possible QtKeycode values check this link qt-keycodes and for unicode values use your favourite unicode character map. 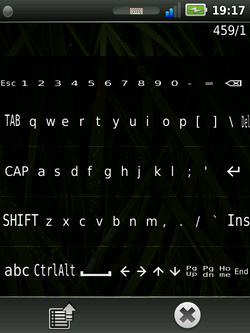 If you want to create a keyboard layout yourself for the abc.svg it is easiest to start with the abc_portrait.svg or abc_landscape.svg DE_de.tar.gz as in those svg files the keys all have an absolute xy position and are all automatically centered, so you can easily change the keysize by chaning the 24px value in the svg with any value you's prefer. They also have exculsively unicode characters which makes moving the keys around a bit easier. The portrait has 6 rows and the landscape keyboard has 4 rows of keys. This installation will remove the original keyboards!!! to replace the original keyboards with the language specific ones. Do not forget to restart QtMoko afterwards. These layouts provide a portrait or a landscape mode for the abc.svg keyboard (more a SMS keyboard now) and abc_shift.svg keyboard. The idea was to be as consistent with the standard querty/quertz layout our brain is used to, so only the qwe and the arrows were moved to different positions. Everything else is pretty much in place though as there are too many keys for portrait mode the upper two rows have been split in two. There are some problems if you switch between abc and qwerty mode. especially if you switch from shifted case to the other keyboard layout. As I do not know the internals of the keyboard switch I currently have no idea on how this might be fixed. 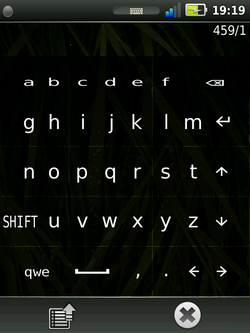 This layout add a new layout : you can know "shift" the simple keyboard. In this new layout you'll find shifted caracters and some special caracters like @ ? ! , ... This keyboard is good for french speaking people, because you'll find also "é" and "à". 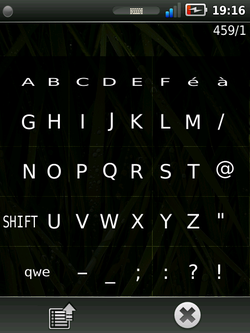 This is partucallary good for french speaking Swiss because the main keyboard is QWERTY and they've QWERTZ keyboard. This keyboard modifies also the switch button : it displays the next layout on his key. 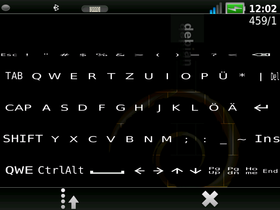 Radek has packaged the keyboard as a .deb package so you can simple navigate to "more apps" and look for keyboards. Do not forget to restart QtMoko afterwards. This page was last modified on 21 August 2012, at 17:50. This page has been accessed 243,249 times.